Each month we ask a soil researcher to select his or her favorite soil. Prof. Peter Finke of the University of Gent is all fired up about Regosols. Peter Finke: Regosols have few diagnostics besides the accumulation of (some) organic matter in the topsoil. This means that they often still strongly bear the signature of the parent material. 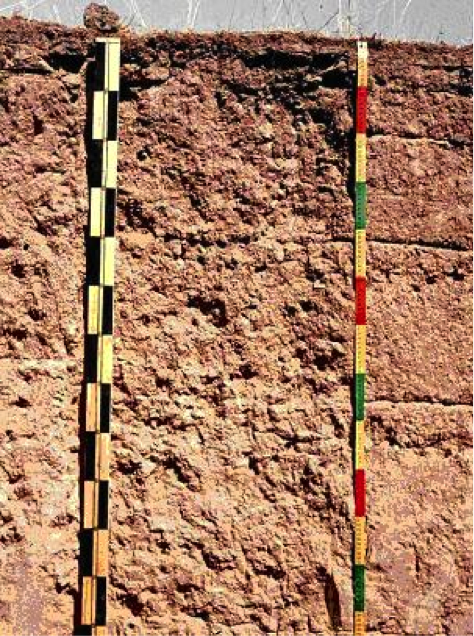 Geologists should love Regosols for this reason: they can easily understand it. Regosols are defined by a soil scientist because of a lot of things they are NOT, as they did not yet have to sufficient time to develop distinct soil formation features. In this sense they are the wastebin of soil classification: They do NOT have well-developed topsoil horizons (mollic, chernic, umbric), illuviation horizons (argic, natric , spodic), or weathered horizons (cambic, ferralic), etcetera. If one does a soil classification, one has to check every possible type of soil before the conclusion “Regosols” can be drawn. It must therefore be a highly appreciated soil by soil classifiers: it is worth a big effort! Regosol in sandy loam with some mottling. It may become a Podzol one day. Peter Finke: Regosols are young, wild and full of potential! They are just starting to become a soil because strong erosion, in some cases deposition (eolian, or of volcanic ash) has prevented or undone soil formation so far. Given time, they may develop in many possible directions. A better name for them would be “sabbatical soils” as they are at a turning point in their career. As a modeller of pedogenesis I often start my simulation with a Regosol, preferably not even having an A-horizon, and am always curious what will happen to it given the type of parent material and the external influences (climate, vegetation, human influences, mass wasting processes). In the initial phase of soil formation, the interaction between biota and the mineral phase is very fragile. 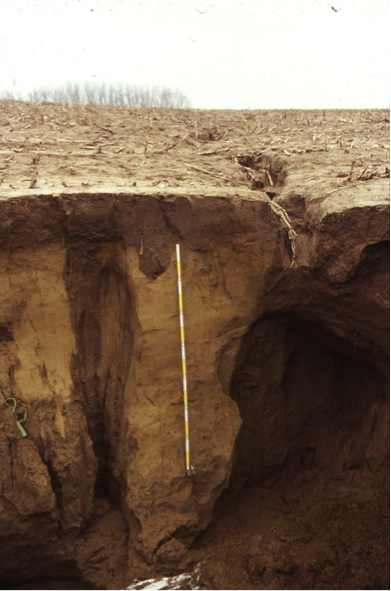 For instance, strong soil settling after deposition will cause pores to be small and prevent roots to grow deeply, which will slow down the formation of an A-horizon. This incipient behaviour is still poorly understood and predictable, but highly relevant, for instance in the context of C-sequestration in circumstances of erosion and deposition. 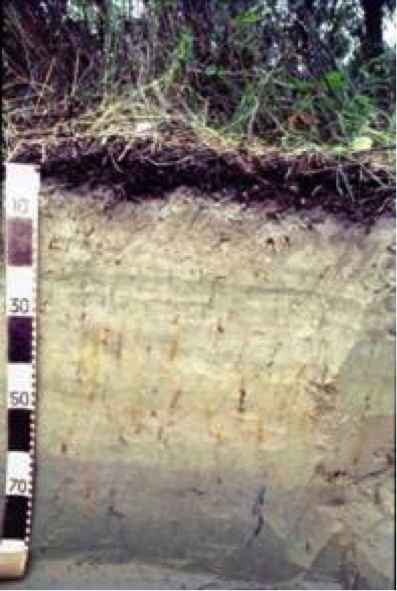 Regosol in silt loam, in an erosion landscape. If man allows, it may become a Luvisol (again) one day. SSSB: Do the properties of this soil type have consequences for its management, e.g. in terms of land use, soil quality, conservation..? Peter Finke: Regosols are of relevance to many soil users. As Regosols are produced continuously, for instance because of severe erosion (loess region), people have to deal with the consequences. Modifying the properties of a Regosol to improve its performance for any ecosystem service is therefore a precise and site-specific task, because the parent material properties can vary widely within Regosols, and also spatially without soil maps indicating all of this variation. Thus, a Regosol user cannot simply use a textbook or soil map to be advised on what to do or not, but instead the user has to become truly involved with this soil to get the best out of it in terms of biomass production and other soil functions. Peter Finke: Being brought up in the peat area north of Amsterdam, it took a while before I experienced mineral soils (and the first one was probably an Arenosol when going to the sea and dunes). The zones behind the dunes grading into the clayey and peat polders was and is famous for its bulb and flower production. The reason for this was that the water table and thus the plant available water could very precisely be managed, and the soil contains few nutrients so they could easily be manipulated with fertilization (and biocides). These are very useful Regosols! Peter Finke is professor at UGent and teaches courses in pedology, soil prospection and classification and soil genesis. His main research interests include the modelling of pedogenesis from the perspective of “natural” genesis as well as prolonged genesis under human influence. Furthermore he is interested in soil mapping, both the development of statistical mapping methods and their application for the construction and updating of spatial soil databases.